-- Follow two children as they celebrate their ancestors in this bilingual introduction to el Día de los Muertos-- the Day of the Dead! 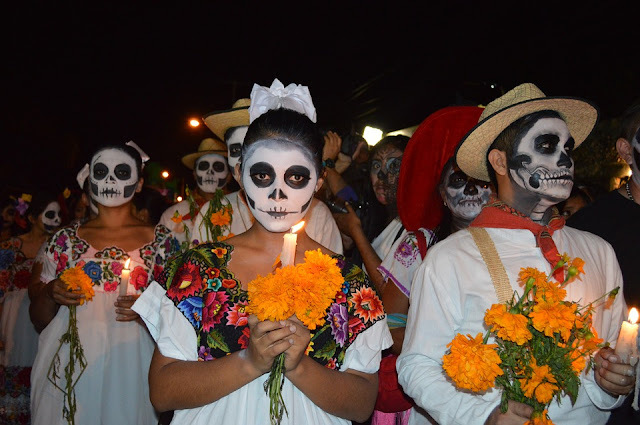 They prepare offerings of flowers, sugar skulls, and special bread, and make delicious foods to eat and share. By spreading marigold petals, they guide the dead home to join the festivities. After hours of singing, dancing, and reminiscing, it's time for bed. The festivities are described in brief, lyrical text, presented in both Spanish and English. An author's note provides more detail on the holiday, its historical context, and the inspiration behind the artwork. • Day Of The Dead Handheld Masks -- With these stick masks now anyone can transform into a skeleton ready to celebrate the Day of the Dead! Hand them out to party guests as a fun party favor or use them to decorate your classroom when teaching students about Day of the Dead celebrations. • Day of the Dead doll Kit -- Knit your own Day of the Dead doll Kit DIY with pattern and knitting needles, yarn, felt, eyes, etc! A wonderful gift for a geeky knitter; or make one for yourself or for a special child, birthday present, stocking stuffer, trick or treat pal, and so forth! • Hand Painted Day of the Dead Mexican Talavera Tiles -- 30 Day of the Dead 2" x 2" Mexican Tiles. Each one is unique and Handpainted by a Talavera artist. Our Talavera is 100% First Quality-No Seconds or Apprentice produced. - There are many households in the United States where the man of the house never cooks for his family. This holiday is an attempt to get those men to take one day out of the year and cook dinner for the family. One guaranteed meal cooked by the man of the house one day of the year! - For one day, you are invited to give up a certain should which lead to stress, guilt, misery, or any sort of sadness. A should is any rigid thought you carry about yourself, the people around you, and the world. - Roman Catholic Holy Day of Obligation. In honor of all the saints, known and unknown. Commemorates the blessed, especially those who have no special feast days. - By celebrating an Authors' Day as a nation, we would not only show patriotism, loyalty, and appreciation of the men and women who have made American literature possible but would also encourage and inspire others to give of themselves in making a better America. - Family literacy programs bring parents and children together in the classroom to learn and support each other in efforts to further their education and improve their life skills. - With all the pet food recalls and contamination concerns, this day focuses on pet nutrition and encourages people to make sure their pets are properly fed. Treat your pet to a nutritious home-cooked meal today! - In 1916, Chubby invented the fried clam and presented his new delicacy — clams from the shell coated with cornmeal and deep fried in a kettle — during the 4th of July parade in Essex, MA. It has been said deep fried clams are to New England what barbecue is to the South.